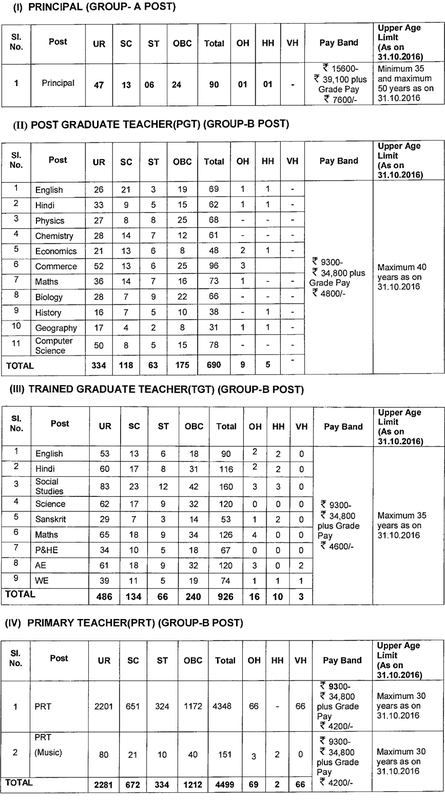 KVS Primary Teacher, TGT & PGT Recruitment 2016 – Apply Online for 6205 Principal & Teaching Vacancies: KVS Teacher Recruitment notification announced. The Kendriya Vidyalaya Sangathan (KVS) has issued a recruitment notification for the posts Primary, Trained & Post Graduate Teacher (PRT, TGT & PGT) vacancies. They have invited online application from Indian citizens for filling up 6205 Principal, Graduate Teacher (PGT, TGT) and Primary Teacher (PRT) vacancies. How to Apply: All those candidates who wish to apply for Kendriya Vidyalaya Sangathan (KVS) Recruitment for Primary Teachers, PGT & TGT posts, they need to fill online application on its official website at kvssangathan.nic.in or mecbsekvs.in from 27 September to 17 October 2016. Follow the instruction below on how to fill online application form. Logo on to KVS official website at kvssangathan.nic.in or mecbsekvs.in. Notification: If you want more information about KVS Primary Teacher, PGT & TGT recruitment such as syllabus, Subject wise posts, official notification/ advertisement, application form and more, read official notification followed by the link given below.